For over 25 years the Kentucky Folklife Program (KFP) has been dedicated to the mission of documenting, presenting, and conserving the diverse traditional culture and heritage of the Commonwealth. Founded in 1989 as an inter-agency partnership between the Kentucky Historical Society and Kentucky Arts Council, KFP moved to its current home at Western Kentucky University (WKU) in 2012. Now housed in the Department of Folk Studies and Anthropology at WKU, KFP is physically located in the Pioneer Log Cabin on WKU’s campus. 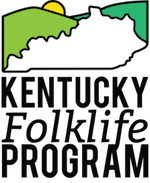 The Kentucky Folklife Program has remained focused on practical folklife and traditional arts projects as we continue to understand the evolving needs of local constituents throughout Kentucky, those who have a crucial stake in documenting the folk traditions of their regions. With our vantage point at WKU, KFP is always exploring exciting and innovative partnership opportunities with other organizations, universities, and folklife programs throughout the nation.